If you’re looking for public golf courses to play in Lakeland, Florida, look no further than the beautiful courses offered at Cypress Lakes. While our resident-members enjoy preferential access to our two 18-hole courses, the public is invited to play them as well. Our North course is an executive-length par 60. Designed by noted golf course architect Chip Powell, this beautiful course is ideal for those looking for speedy-yet-challenging play. Our South Championship Course has been noted in such publications at Golf Digest and Florida Golfer as having some of the best greens in the Sunshine State. 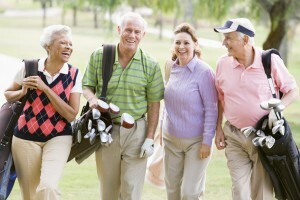 However, unlike other retirement communities in the state, we offer resort-style living that’s affordable. Our homes are priced with the discerning, budget-conscious retiree in mind, but don’t skimp on quality. Our homes are well-crafted manufactured homes, many of which have been remodeled to include upgraded cabinetry and other updates and conveniences. They’re also designed to be low-maintenance so our residents can spend their time making memories, rather than doing chores. To schedule a tee time on one of our public golf courses, click here. If you’re interested in learning more about life at Cypress Lakes, call a member of our team in Lakeland, FL, today.